We specialize in manufacturing and selling premium quality Aluminum stand. Innovative and exclusive design made us stand out from the competition. Our mission is to deliver the best quality in the market. Trust us, you won't regret it! 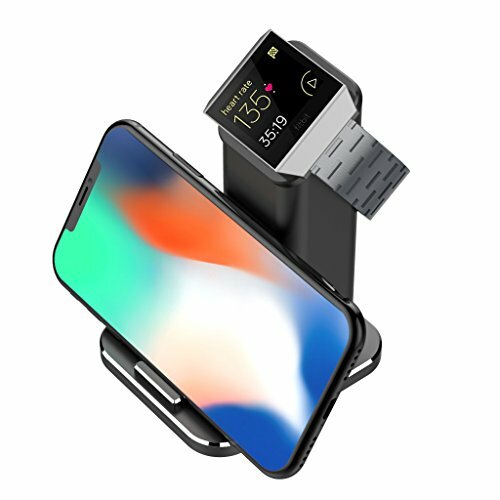 Hold you phone and your apple watch simultaneously: watching video or enjoy your movie by using the phone mount; charging you Fitbit Ionic watch (2017 released). Sleek and simple design of this iphone stand provide a best charging method for your Fitbit Ionic smart watch, also a phone holder for watching video. Looking concise and neat. Thoughtful details of the anti-scratches pad protects any corner of your device and the desk, we take everything into consideration to win your satisfaction. 1.One Cables are installed in the Fitbit ionic charger. If you have any questions about this product by XUNMEJ, contact us by completing and submitting the form below. If you are looking for a specif part number, please include it with your message.